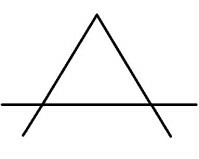 In this problem each letter stands for one digit and has the same value throughout the equation. 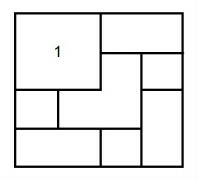 Find the appropriate digits to make the following subtraction problem work. Find the largest number that can be divided into 701, 1059, 1417 and 2312 and leaves the same remainder. Trial and error will work, but there is a much simpler way to find the number. Answer: Subract each number from every other. We get 895,1253, 1611, 716, 358 and 358. Notice 358 = 2 x 179. Thus, the only number that can divide in every case with no remainder is 179. 179 is the divisor we want. By checking, one sees that it will always leave a remainder of 164. 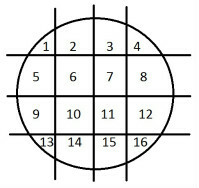 Six lines were used to cut this circle into 16 pieces. 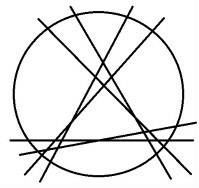 Can you use six lines to cut the circle into more than 16 pieces? 22 is the maximum. A group of four people has to cross a bridge. It's dark and they have to light the path with a flashlight. No more than two people can cross the bridge simultaneously, and the group has only one flashlight. It takes different time for each person to cross the bridge. Annie crosses in 1 minute. Bob crosses in 2 minutes. Chris crosses in 5 minutes. Dorothy crosses in 10 minutes. How can the group cross the bridge so that it takes 17 minutes? Using exactly five 5's, construct an expression that will equal 100. You may use addition, subtraction, multiplication and division as well as parentheses or brackets. There are three such expressions. Can you find them? Below is a five-digit number. Find the digits to replace R and T so that the number will be divisible by both 9 and 4. 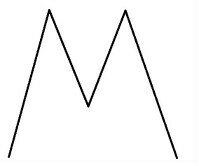 R, however, cannot equal T.
Add three straight lines to the letter M to get nine triangles. 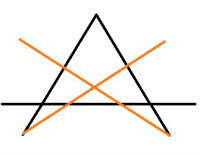 The triangles cannot overlap. An animal lover has seven pets. Some are cats, the rest are dogs. Each dog eats five biscuits and each cat four biscuits. Thirty-two biscuits in all are eaten. How many dogs and how many cats are there? Answer: c + d = 7 and 4c + 5d = 32. Solve the system of equations to find 4 dogs and 3 cats. Can you express the number 100 using six nines and no other digits? 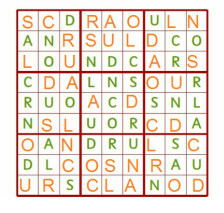 Answer: A W because the letters are the first letter in each word in the instructions. When Mr. Johnson was married 18 years ago, he was three times as old as his wife. Today he is only twice as old as his wife. How old was Mrs. Johnson when they got married? A man has to get a fox, a chicken, and a sack of corn across a river. If the chicken and the corn is left together, the chicken will eat the corn. Answer: He takes the chicken across first, then goes back to get the fox. He takes the fox across, and he brings the chicken back with him. Then, he takes the sack of corn across and goes back for the chicken. A mother has 2 children whose ages differ by 5 years. The sum of the squares of their ages is 97. The square of the mothers age can be found by writing the squares of the childrens' ages one after the other as a four digit number. How old is the mother? Answer: 41 years old. Her children are 4 and 9. When Brenna arranges her Barbie dolls in rows of 6, she has one left over. If she uses rows of 8, she has 3 left over. Rows of 9 leave 7 extra and rows of 10 leave 5 extra. How many Barbie dolls does she have? Eight identical square pieces of paper are placed on a desk. They overlap each other as shown. Sheet 1 is on top and is completely visible. All the other pieces are only partly exposed. Number the squares in order from the second layer from the top (#2) to the bottom (#8). 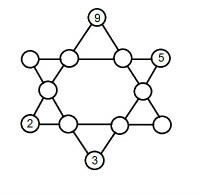 Place the intergers from 1 through 12 in the circles of the star below. 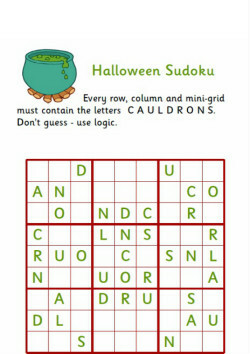 The sum of each of the six rows must total 26. Some numbers have already been placed. 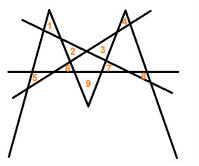 Add two lines to the drawing to make a total of 10 triangles, counting all the overlapping triangles. 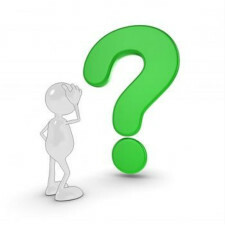 What 5-letter word becomes shorter when you add 2 letters to it? A canoe carries only 200 pounds. How can a mother, weighing 200 pounds, and her two sons, each weighing 100 pounds, use the canoe to cross a lake? The two sons go first. One son brings back the canoe and the mother rows over. Then the other son returns for his brother. Does the letter "Z" belong on the top row or on the bottom? Why? "Z" belongs in the tip row because all of the numbers in the top row are made up of only straight lines. I am thinking of a three-digit number. If you subtract 5 from it, the result is divisible by 5. If you subtract 6 from it, the result is divisible by 6. If you subtract 7 from it, the result is divisible by 7. What is the smallest number that will satisfy these conditions? Therefore, x must be divisible by 5, 6, and 7. 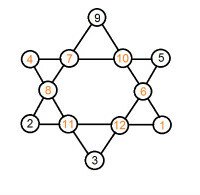 The least common multiple of 5, 6, and 7 is 210.